Adult Stem Cells Reprogrammed in Their Natural Environment Monday, 30 June 2008 In recent years, stem cell researchers have become very adept at manipulating the fate of adult stem cells cultured in the lab. Now, researchers at the Salk Institute for Biological Studies achieved the same feat with adult neural stem cells still in place in the brain. They successfully coaxed mouse brain stem cells bound to join the neuronal network to differentiate into support cells instead. 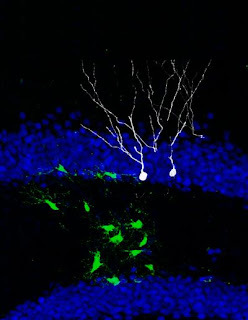 The discovery, which is published ahead of print on Nature Neuroscience's website, not only attests to the versatility of neural stem cells but also opens up new directions for the treatment of neurological diseases, such as multiple sclerosis, stroke and epilepsy that not only affect neuronal cells but also disrupt the functioning of glial support cells. "We have known that the birth and death of adult stem cells in the brain could be influenced be experience, but we were surprised that a single gene could change the fate of stem cells in the brain," says the study's lead author, Fred H. Gage, Ph.D., a professor in the Laboratory for Genetics and the Vi and John Adler Chair for Research on Age-Related Neurodegenerative Diseases. Throughout life, adult neural stem cells generate new brain cells in two small areas of mammalian brains: the olfactory bulb, which processes odours, and the dentate gyrus, the central part of the hippocampus, which is involved in the formation of memories and learning. After these stem cells divide, their progenitors have to choose between several options – remaining a stem cell, turning into a nerve cell, also called a neuron, or becoming part of the brain's support network, which includes astrocytes and oligodendrocytes. Astrocytes are star-shaped glia cells that hold neurons in place, nourish them, and digest parts of dead neurons. Oligodendrocytes are specialized cells that wrap tightly around axons, the long, hair-like extensions of nerve cell that carry messages from one neuron to the next. They form a fatty insulation layer, known as myelin, whose job it is to speed up electrical signals travelling along axons. When pampered and sheltered in a petri dish, adult neural stem cells can be nudged to differentiate into any kind of brain cell but within their natural environment in the brain career options of neural stem cells are thought to be mostly limited to neurons. "When we grow stem cells in the lab, we add lots of growth factors resulting in artificial conditions, which might not tell us a lot about the in vivo situation," explains first author Sebastian Jessberger, M.D., formerly a post-doctoral researcher in Gage's lab and now an assistant professor at the Institute of Cell Biology at the Swiss Federal Institute of Technology in Zurich. "As a result we don't know much about the actual plasticity of neural stem cells within their adult brain niche." Should Great Apes be Granted Human Rights? Should Great Apes be Granted Human Rights? Thursday, 26 June 2008 Reuters report that "Spain Give Great Apes Human Rights". What do you think? Are great apes equal to humans, or should humans instead be considered equal to great apes? Finding offers hope of recapitulating developmental events to regenerate tissue Sunday, 22 June 2008 Researchers at Children's Hospital Boston are continuing to document the heart's earliest origins. Now, they have pinpointed a new, previously unrecognized group of stem cells that give rise to cardiomyocytes, or heart muscle cells. These stem cells, located in the surface of the heart, or epicardium, advance the hope of being able to regenerate injured heart tissue. This finding, published online by the journal Nature on June 22, comes on the heels of parallel cardiac stem cell discoveries in 2006, at both Children's and Massachusetts General Hospital. Then, the Children's team found that a specific stem cell or progenitor, marked by expression of a gene called Nkx2-5, forms many components of the heart: heart muscle cells, vascular smooth muscle cells, and the endothelial cells lining blood vessels in the heart's left-sided chambers. The team at MGH found a related progenitor, marked by expression of the Isl1 gene, which produces these same cell-types in the right-sided heart chambers. Now, researchers at Children's have shown that heart muscle cells can also be derived from a third type of cardiac progenitor, located within the epicardium and identifiable through its expression of a gene called Wt1. "There's a lot of interest in finding places to obtain new cardiomyocytes, because in heart failure, you lose cardiomyocytes, so the only way to reverse heart failure is to make more of these cells," said William Pu, MD, a paediatric cardiologist at Children's who was the study's senior investigator. Although epicardial cells are known to give rise to smooth muscle and endothelial cells during coronary vessel formation, nobody previously thought that epicardial cells might turn into cardiomyocytes. "I couldn't believe it at first, myself," said Bin Zhou, MD, a research fellow in Pu's laboratory and the study's first author. The results were independently corroborated by researchers from the University of California, San Diego. Using a different genetic marker, Tbx18, the UCSD team also showed that cardiomyocytes can be derived from the epicardium, and their study will be published in the same issue of Nature. Pu and Zhou showed that a specific population of cells in the epicardium, marked by Wt1 expression, not only differentiated into cardiomyocytes, but also smooth muscle cells, endothelial cells and fibroblasts (found in connective tissue). "If you're going to regenerate a tissue, you need to regenerate the whole tissue, not just the cardiomyocytes," said Pu. "This progenitor population contains all the potential to regenerate multiple tissue types within the heart." In recent years, the scientific literature has described many progenitors for cardiomyocytes, Pu added, but the markers used frequently did not play a direct role in heart development. For example, Sca-1 and c-Kit are markers that most stem cells express throughout the body, with no cardiac or developmental specificity. "I think our best chance of getting a cell to do what we want is to modify what it was designed to do," Pu elaborated. "Some of these other progenitors were isolated in the adult heart, but we don't know what they do in the normal heart, and what they're related to in the embryo. However, we clearly know what progenitors expressing Wt1, Nkx2-5, and Isl1 do in the foetus: they can make fibroblasts, blood vessels, and cardiomyocytes. Therefore we think we have a good shot, in the adult heart, of recapitulating these events." Pu considers his and Zhou's discovery to be a fortunate accident. They were trying, instead, to study a different gene, GATA4, by deleting it in the epicardium. "The tool we created for that experiment irreversibly marks the cells involved, so you can see where their descendants are headed in normal development," Pu explained. "Unexpectedly, we saw that these epicardial cells were becoming cardiomyocytes — it was a lucky observation." Pu and Zhou tagged the Wt-1 expressing epicardial cells with a fluorescent red protein, and then allowed the cells to differentiate. 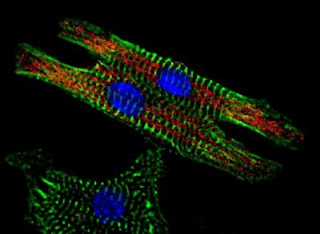 The image shows a descendent cardiomyocyte (green) that carries the same red marker, and another cell that arose from different origins. 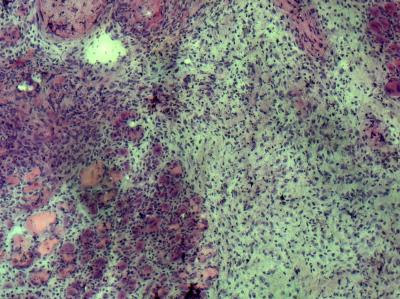 (The blue stain indicates cell nuclei). Credit: Bin Zhou, MD (Children's Hospital Boston). Fertile women release one or more eggs every month, but until now, only animal ovulation has been recorded in detail. Now, gynaecologist Dr Jacques Donnez spotted the release of a human egg in progress, during a routine hysterectomy. He could film the process in close-up, when the egg was emerging from the ovary. Human eggs are produced by follicles, fluid-filled sacs on the side of the ovary, which, around the time of ovulation, produce a reddish protrusion seen in the pictures. The egg comes from the end of this, surrounded by a jelly-like substance containing supportive cells. The egg itself is only the size of a full-stop, and the whole ovary, which contains many immature eggs, just a couple of inches long. Dr Donnez, from the Catholic University of Louvain, told New Scientist that the pictures would help scientists understand the mechanisms involved in ovulation. He said that some theories had suggested an "explosive" release for the egg, but the ovulation he witnessed took 15 minutes to complete, so the event was progressive. 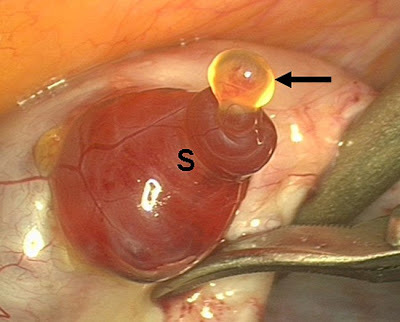 These images are the first time the event of ovulation in humans has been captured in clear detail. The yellow blob is a protruding egg cell, surrounded by supportive cumulus cells (at the black arrow). 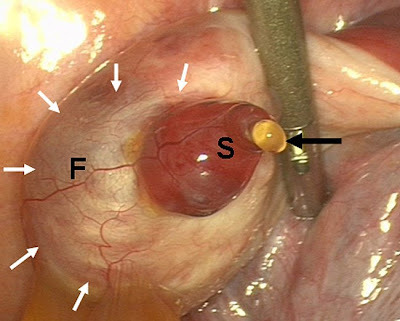 The reddish part is the follicle (S), and the pale pink tissue is part of the ovary (F). Ovulation takes place on the surface of the ovarian tissue. 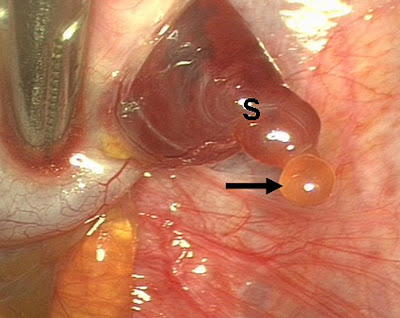 The egg, surrounded by supportive cumulus cells, is shown emerging from the follicle on the ovary. 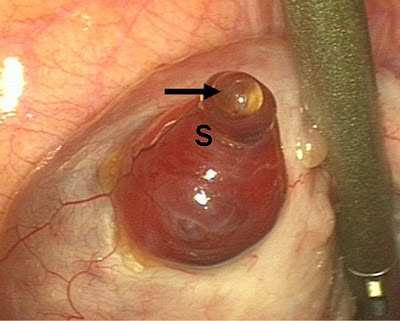 After the release from the follicle, the egg travels down the Fallopian tube where it can be fertilised. Credit: The above pictures was kindly provided by Prof. Jacques Donnez, at Université Catholique de Louvain, Brussels, Belgium, and Eric Steinmehl, managing editor at “Fertility and Sterility” and the American Society for Reproductive Medicine, Birmingham, Alabama. Jean-Christophe Lousse, M.D., Jacques Donnez, M.D., Ph.D.
How much is a human egg worth? Back to the question: How much is a human egg worth? Stem Cell Researchers Give Old Muscle New Vigour Tuesday, 17 June 2008 Old muscle got a shot of youthful vigour in a stem cell experiment by bioengineers at the University of California, Berkeley, setting the path for research on new treatments for age-related degenerative conditions such as muscle atrophy or Alzheimer's and Parkinson's diseases. In a new study to be published June 15 in an advanced online issue of the journal Nature, researchers identified two key regulatory pathways that control how well adult stem cells repair and replace damaged tissue. They then tweaked how those stem cells reacted to those biochemical signals to revive the ability of muscle tissue in old mice to repair itself nearly as well as the muscle in the mice's much younger counterparts. Irina Conboy, an assistant professor of bioengineering and an investigator at the Berkeley Stem Cell Center and at the California Institute for Quantitative Biosciences (QB3), led the research team conducting this study. Because the findings relate to adult stem cells that reside in existing tissue, this approach to rejuvenating degenerating muscle eliminates the ethical and medical complications associated with transplanting tissues grown from embryonic stem cells. "We are one step closer to having a point of intervention where we can rejuvenate the body's own stem cells so we don't have to suffer from some of the debilitating diseases associated with aging," said the study's lead author, Morgan Carlson, a recent Ph.D. graduate of Conboy's lab. The researchers focused on the interplay of two competing molecular pathways that control the stem cells, which sit next to the mature, differentiated cells that make up our working body parts. When the mature cells are damaged or wear out, the stem cells are called into action to begin the process of rebuilding. "We don't realize it, but as we grow our bodies are constantly being remodelled," said Conboy. "We are constantly falling apart, but we don't notice it much when we're young because we're always being restored. As we age, our stem cells are prevented, through chemical signals, from doing their jobs." The good news, the researchers said, is that the stem cells in old tissue are still ready and able to perform their regenerative function if they receive the appropriate chemical signals. Studies have shown that when old tissue is placed in an environment of young blood, the stem cells behave as if they are young again. "Conversely, we have found in a study published last year that even young stem cells rapidly age when placed among blood and tissue from old mice," said Carlson, who will stay on at UC Berkeley to expand his work on stem cell engineering either as a QB3 fellow or a postdoctoral researcher. 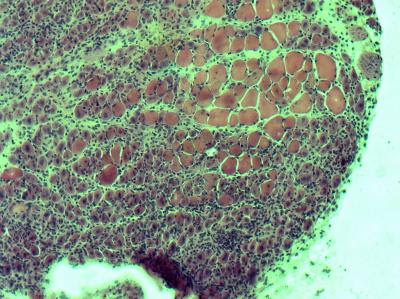 Adult stem cells have a receptor called Notch that, when activated, tells them that it is time to grow and divide, the researchers said. But stem cells also have a receptor for the protein TGF-beta that sets off a chain reaction activating the molecule pSmad3 and ultimately producing cyclin-dependent kinase (CDK) inhibitors, which regulate the cell's ability to divide. "Interestingly, activated Notch competes with activated pSmad3 for binding to the regulatory regions of the same CDK inhibitors in the stem cell," said Conboy. "We found that Notch is capable of physically kicking off pSmad3 from the promoters for the CDK inhibitors within the stem cell's nucleus, which tells us that a precise manipulation of the balance of these pathways would allow the ability to control stem cell responses." Notch and TGF-beta are well known in molecular biology, but Conboy's lab is the first to connect them to the process of aging, and the first to show that they act in opposition to each other within the nucleus of the adult stem cell. As muscle tissue ages, it loses its ability to adequately repair itself from damage. 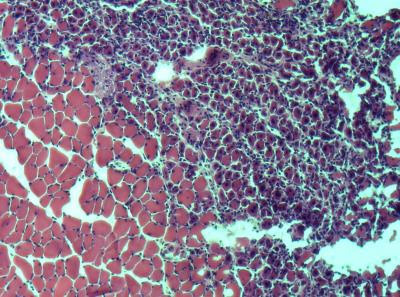 Instead of creating healthy, new cells to replace damaged ones, the old muscle tissue is left with fibroblasts and scar tissue, as shown here. Credit: Photo courtesy of Morgan Carlson and Irina Conboy, UC Berkeley. Small Molecule Stimulates Nerve Stem Cells to Mature Tuesday, 17 June 2008 Inspired by a chance discovery during another experiment, researchers at UT Southwestern Medical Center have created a small molecule that stimulates nerve stem cells to begin maturing into nerve cells in culture. This finding might someday allow a person's own nerve stem cells to be grown outside the body, stimulated into maturity, and then re-implanted as working nerve cells to treat various diseases, the researchers said. "This provides a critical starting point for neuro-regenerative medicine and brain cancer chemotherapy," said Dr. Jenny Hsieh, assistant professor of molecular biology and senior author of the paper, which appears online today and in the June 17 issue of Nature Chemical Biology. Drs. Jenny Hsieh and Jay Schneider are among the researchers who created a small molecule that stimulates nerve stem cells to begin maturing into nerve cells in culture. This development that might someday allow a person’s own nerve stem cells to be grown outside the body, stimulated into maturity, and then re-implanted as working nerve cells to treat various diseases.